After suppression the Karelian uprising of 1921-1922 contrary to the Finnish political pressure the Central Committee of C.P.S.U.(B.) on March 5th 1922 decided to start finnisation of the Karelian Labour Commune. The leadership in the Karelian Labour Commune went to so-called "Red Finns¹". The Finnish language became the official language in the Commune. It was used as the main language in Karelian schools and as a language used for cultural and political work among Karelians. On July 25th 1925 the Karelian Labour Commune was transformed into Autonomous Karelian Soviet Socialist Republic (AKSSR). In the political perspective the "Red Finns" saw the AKSSR as the outpost of the "world revolution" in the North of the Europe. They meant including it into "The great Red Finland²" and even "Red Scandinavia". Among other things the Finnisation policy meant creating in the AKSSR special national military unit. In October 15th 1925 in Petrozavodsk was created the Karelian jäger battalion. The battalion consested of four companies. The first battalion commander was Eyolf Igneus-Mattson³, holding the position till 1928. The first commissar was A.Mantere. In 1927th he was replaced by Urho Antikainen⁴. National military unit was current personally by the Chairman of the AKSSR Soviet of the People's Commissar's Edvard Gylling. The battalion quarters were in Petrozavodsk, in the buildings of the former Orthodox theological seminary on Gogol street. In 1927-28 the head of battalion club was Ragnar Nyström – the poet, writer, playwright, the future founder of Karelian National Theatre on Petrozavodsk. In October 1931 "due to aggressive external policy of Finland towards the USSR" and because of the high number of convicts on the territory of the AKSSR the battalion was transformed into Karelian jäger brigade. Brigade raising was completed on December 25th 1931. The brigade commander, by recommendation of Edvard Gylling, became Eyolf Igneus-Mattson. The Karelian jäger brigade consisted of two jäger battalions (Petrozavodsk and Olonets), artillery battalion, field company and communication company. The brigade was a territorial military unit – the soldiers served their five-year terms near their homes by the way of serving several 8 to 12 months muster. In the case of mobilization two more battalions should be formed (Zaonezhsky and Vepsky). In June 1932, when Karelian registration and enlistment office was liquidated the brigade Headquarters were supplemented with enlistment and quarters departments. The territorial formation of military units was usual for the Red Army at the time, but the name "jäger" was unique. It was proposed by the management of the AKSSR in analog with Finnish jäger units. Another big difference was that all commanding posts it the brigade were occupied by Finns⁵ and Karelians. The Karelian jäger brigade was the only military unit on the territory of AKSSR. In the case of war with Finland the brigade operative plans were to cover Petrozavodsk from Finnish invasion. The last stand, as in 1919 planned to be the Sulashgora Heights. As an alternative there were plans to move brigade to Kola Peninsula to repel the British landing forces. The activities of "Red Finns" were going on the background of increasing political repression. In the spring 1930 OGPU⁶ arrested a group of "Red Finns" holding commanding positions in the detached Karelian jäger battalion. The second wave of arrests began in 1932 and involved mainly the officers of the 2nd (Olonets) battalion of the detached Karelian jäger brigade. 20 men were shot as a result of investigation on the cause of "counterrevolusionary rebel organisation". In 1933 OGPU "disclosed" so called "the plot of Finnish General Headqurters". Part of the commanding officers of the detached Karelian jäger brigade were subjected to repressions. Since January 1934 brigade commander was Josef Kalvan⁶. In 1935 the "Red Finns" were removed from the ruling posts in Karelia and the detached Karelian jäger brigade was disbanded. At the end of 1935 on the territory of AKSSR there was stationed 18th Yaroslavl infantry division, holding the Order of the Red Banner. Some units of the Karelian brigade were incuded into it. 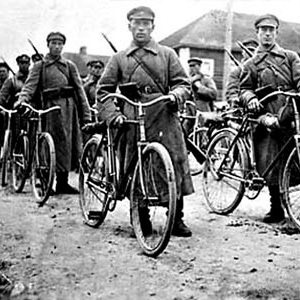 ¹ Members of the 1918 Red revolt in Finland, found exile in the Soviet Russia. ² The idea later was realised in the Treaty on mutual help and friendship between the USSR and marionette Finnish Democratic Republic of December 2nd 1939. ³ Was born in the well-to-do Swedish family on Åland Islands (Finland) at July 22, 1897. Graduated the Higher technical school in Helsinki. Participated in the Red revolt, after defeat of which exiled in the Soviet Russia, where finished Petrograd International military school. From the summer 1919 was a commander of the 2nd battalion of 164th infantry regiment (in the August 1919 renamed to the 2nd Finnish regiment), took part in the battle at Sulazhgora Heights. Was decorated with the Order of the Red Banner. Graduated from the Military Academy of the Red Army. In 1925-1928 – commander of the detached Karelian jäger battalion, in 1931-1934 – commander of the detached Karelian jäger brigade. In November 26th 1935 he was conferred the rank of Kombrig (brigade general). In 1936 became the head of sub-faculty of general tactics in the M.Frunze Military Academy of the Red Army. In May 28th 1936 went under repressions. Released in 1946. Rehabilitated in 1957. Died in May 25th 1965. ⁴ Younger brother of Toivo Antikainen. ⁵ Mainly graduates of the Petrograd International military school (1918-1926). ⁶ The Latvian. Was born in January 25th, 1896 in a peasant family. Was decorated with the three Orders of the Red Banner. In November 26th 1935 he was conferred the rank of Kombrig (brigade general). Arrested in December 2nd 1937. Executed in September 12nd, 1938. ⁷ OGPU (Special Main Political Department) – Soviet secret service and internal political gendarmerie. In June 10th 1934 included into NKVD (People's Commissariat of Internal Affairs). ⁹ Corps commander and Minister of defence in the government of the marionette Finnish Democratic Republic was Komdiv (division general) Aksel Anttila – former Karelian jäger brigade headquarters deputy chief.